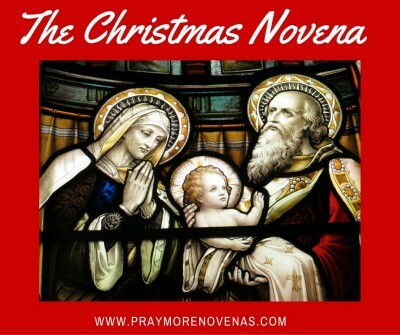 The Next Novena: The Christmas Novena! We are excited to announce that the next novena we will pray is the Christmas Novena! This was the very first novena we ever prayed through Pray More Novenas — and that was seven years ago. At the time, we didn’t have very many people subscribed to pray with us… And now, there are more than 380,000 people praying with us! Praise God for this community! We have prayed for the same general intention each year that we pray this novena, and that’s for an end to abortion. There is no better time than to reflect on the most vulnerable of this world than during Advent and Christmas when we prepare for the birth of our Lord Jesus Christ, who comes to us as a small baby. We will begin praying on Saturday, December 16th. That’s just a few days away! Lastly, we may be well into the Advent season right now but it is still not too late to dedicate yourself to praying more & preparing more for Jesus Christ to come into your heart & home this Christmas. The online Pray More Advent Retreat is still available — you can sign up for it here. It is never too late to grow closer to Christ. I never get Day 1 of the Novenas, just day two ??? Could you check on this, thank you…. As promised, that if St Rita Interceded in a request, that we need to share about it with others. I started this Novena to St Rita on Sunday to help me find work, as I have been out of work for about a month now. I found out today, 6 days after starting the Novena, that I got another job. Thank you, St Rita. when are you going to do something, that is if you know what to do??? OR ARE YOU JUST WANT A FOLLOWING??????????? I NEED MY PRAYERS ANSWERED…………!!!!!!!!!!!!!! His order is divine; His intentions and doings are perfect. You will see his THRUTH unravel before his eyes. Peace.